Bachelor of the Week – Kansas!- ADOPTED! Does your name happen to be Dorothy? Because we are DEFINITELY in Kansas. On today’s episode, we have Kansas, a sleek black whippersnapper of only four years old. 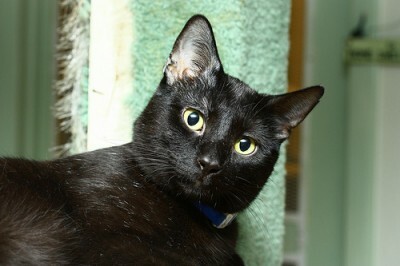 Kansas, who lives at Cat Guardians, is dealing with two challenges in his quest for love: he’s FIV+ and he’s black. Did you know that black cats are the most overlooked color of cat when it comes to adoption? Sad, but true. His FIV+ status requires that he have a little extra care because of his compromised immune system, but with regular checkups and a little extra care, Kansas will live a normal, healthy life. (Check back soon for my upcoming article on FIV+ cats.) 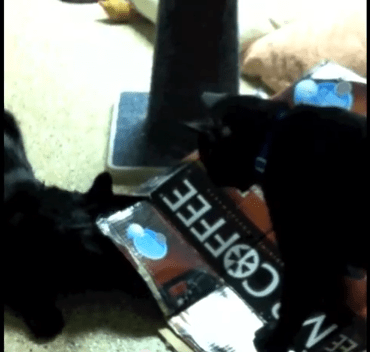 He loves to snuggle and play, and, as you can see here in his little film, he’ll put the smack down on anyone that gets in his Mr. Coffee box. He’s excellent with children and other cats. Help this underdog, err, undercat, and share your love with him today! He could be just the kindred spirit you’re looking for. Once you go to Kansas, you never go back. I dropped a Mr. Coffee box on your sister! Kansas is so handsome…we hope he gets a forever home soon. 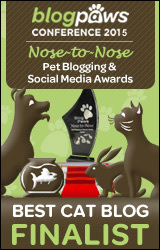 We posted our award today! Thanks again! We REALLY hope he gets a new home soon! I wish WE could take him – he’s GORGEOUS! Kansas is really handsome! Kitshka thought so too! two yur new forever home rite away…..
Kansas you’re gorgeous!!! Hang in there baby – being “Bachelor of the Week” is a very lucky thing. The very first Bachelor, Tabby’s Place’s very own D’Artagnan went to his furrever home just yesterday!! It’ll happen for you too! 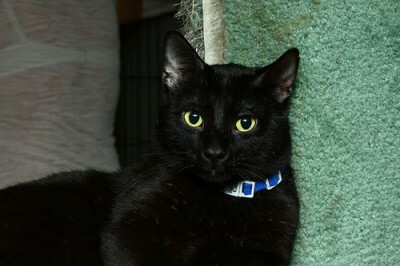 Panther is a beautiful kitty, hope he finds a good home. FIV kitties are so sweet and special.